Unicaf University is an independent, multi-campus tertiary institution, combining the best elements of international education, to offer high quality, internationally recognised qualifications. Unicaf University pursues excellence in teaching, as well as in student achievement and satisfaction, in a continually improving academic environment. The University is committed to setting the agenda on flexible learning in higher education in Africa, investing in learning development and working with governments to drive the evolution of the online learning environment. UU aims to become the leading university in sub-Saharan Africa, recognised for its outstanding contribution to teaching, learning and research. Unicaf University offers students the chance to boost their knowledge and personal skills, advance their careers and build the lives they are dreaming of. 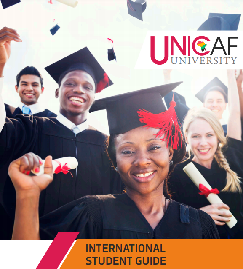 Thanks to its unique association with the UNICAF Scholarship Programme, one of the most generous programmes of its kind, Unicaf University is able to offer internationally recognised Bachelor, Master’s and Doctorate programmes at a fraction of the cost. Students can study online, or through blended learning, an innovative combination of online delivery and class room instruction. They can keep their jobs and continue to care for their families, fitting their studying around their lifestyle and personal commitments. An extensive network of tutors, instructors and administrators provide continuous support to students, from the day of enrollment through to graduation. In Unicaf University’s state-of-the-art Zambia Campus, students are taught by experienced local and international tutors, in a highly professional learning environment. The UNICAF Virtual Learning Environment, the digital platform used for online teaching, is very easy to navigate; online students have a well-stocked e-library at their disposal and through the popular chatrooms can interact with fellow students from around the world, to exchange ideas and network. For those who choose blended learning, online teaching is enhanced with lectures and seminars offered at the fully equipped campus in Lusaka. The select range of study programmes on offer at the UU Zambia Campus is enriched with the addition of new courses every year, in a quest to be a leading provider of accessible and affordable, internationally recognised degree programmes in sub-Saharan Africa and the region. All Unicaf University Zambia undergraduate and post graduate degree programmes are accredited by the Higher Education Authority Of Zambia (HEA). To download the International Student Guide for the Zambia campus, click here. Copyright © 2019 Unicaf University ® | All rights reserved | In partnership with UNICAF. Unicaf University ® is a registered trademark in the EU.